Lincoln Recruitment Specialists are pleased to announce the appointment of Donal Whelan as Head of our Compliance and Risk Division. Donal brings many years of national and international recruitment experience to the Lincoln team. 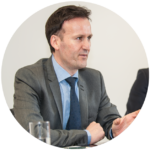 In 2011, Donal began his career in recruitment when he moved to New Zealand and spent two years working with a global recruitment firm focusing on the finance sector before moving back to Ireland. He has since specialised in the recruitment of professionals in the Compliance, Risk and Finance markets. Donal’s knowledge of this sector will be a great asset for Lincoln in continuing to provide our clients with the best service and insights in the recruitment of Compliance and Risk professionals across Ireland and further afield.